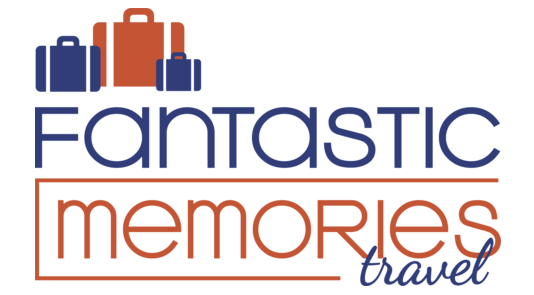 One of the best ways to get to know a place is to experience local food favorites. You could find a familiar chain restaurant almost anywhere in the world. But why take a six-hour flight to get what you can get at the end of the block? Eating local food means seeking out foods that are unique to the location and reflect local cultural influences. 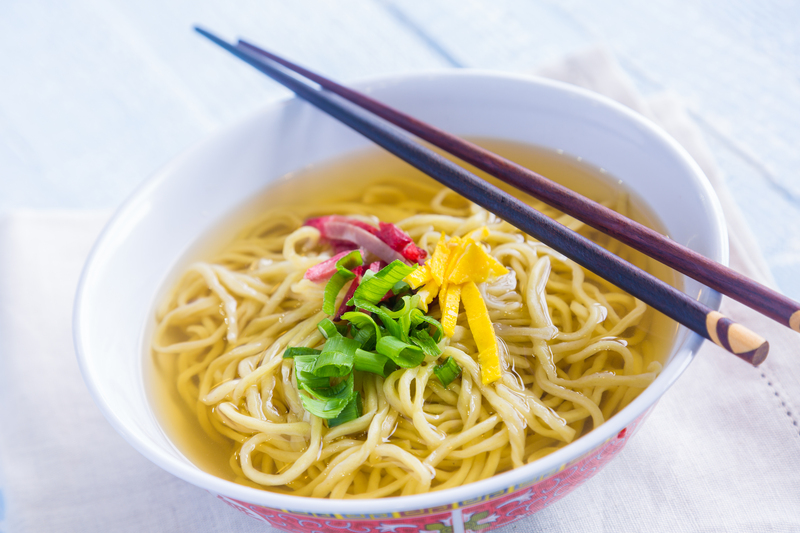 At first glance, saimin appears pretty much the same as its more-familiar cousin, ramen. But saimin is uniquely Hawaiian. It’s a microcosm of Hawaiian culture itself. It is believed to have originated as a sort of “stone soup.” Migrant plantation workers each contributed something to a communal pot. A Filipino family might contribute some green onion from their small garden, some sausage from the Portuguese, a couple of eggs from Hawaiian locals who kept chickens, and some cabbage trimmings left over from the Korean family’s kimchi preparations. They were all tossed into a Japanese dashi broth along with Chinese mein noodles. 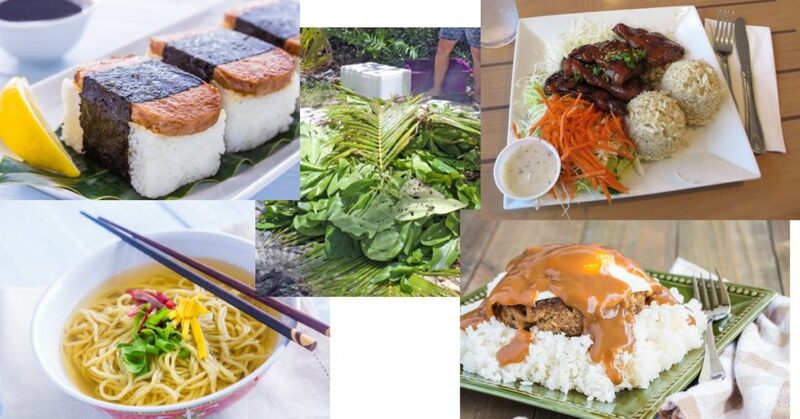 It’s a melange that mirrors Hawaii’s multi-ethnicity, and many consider it Hawaii’s national dish. (It’s so ubiquitous that it’s even on the menu at McDonald’s in Hawaii)! Where to go for saimin? Shige’s Saimin Stand (Oahu) – An “old school” foodie favorite. Shige’s is one of the last Oahu saimin stands that still makes its own noodles fresh in-house. Hamura’s Saimin Stand (Kauai) – Recognized as a James Beard Foundation America’s Classic in 2006. Save room for dessert so you can try the signature lilikoi chiffon pie. 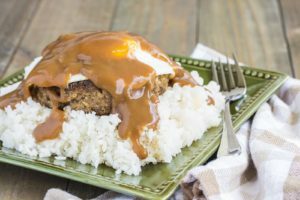 Loco moco was created around 1949, when some teenagers in Hilo asked for a quick, filling and inexpensive meal that wasn’t a sandwich. The answer was a bowl of steamed rice topped with a hamburger patty and brown gravy. (Later, a sunny side up egg became a staple addition). The kids came up with the name “Loco Moco,” partially in tribute to their buddy whose nickname was “Crazy.” They knew enough Spanish to know “loco” and think that sounded good when combined with “moco.” (Unfortunately, they didn’t know enough Spanish to know that, to a Spanish speaker, the dish’s name means a rather unappetizing “crazy snot” or “crazy mucus.”). Loco Moco has since spread to other restaurants and now refers to rice bowl dishes that include a wide variety of ingredients. In addition to Big Island Grill mentioned above, you’ll find great Loco Moco at Cafe 100, on the Hilo side of the Big Island. The Plate Lunch is probably the single most iconic Hawaiian meal. It has its roots in the lunches served to plantation workers. The meal consists of two scoops of white rice, one scoop of mayonnaise-based macaroni salad and some kind of entrée, which can range from teriyaki beef to fish to pork adobo. Rainbow Drive-In (Oahu) – This Waikiki Beach institution for over five decades was featured on the television series Diners, Drive-Ins, and Dives for its plate lunch (and they’re proud of their Loco Moco too). 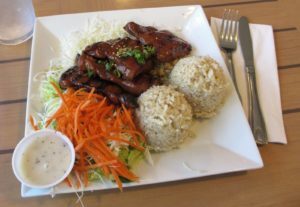 Aloha Mixed Plate (Maui) – Aloha Mixed Plate is a Lahaina, Maui-local chain, which has been awarded multiple Best Plate Lunch awards by Hawai‘i Magazine’s readers. Kalua Pig is best known as the signature dish at a traditional Hawaiian luau. (And it has nothing to do with the equally-delicious-in-its-own-way-but-totally-different Mexican liquer Kahlua). 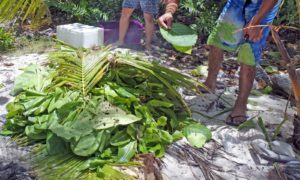 The keys to kalua pig are the imu, an underground oven, and the banana trees and/or ti leaves that are placed between the hot rocks at the bottom of the cooking pit and the food being cooked. 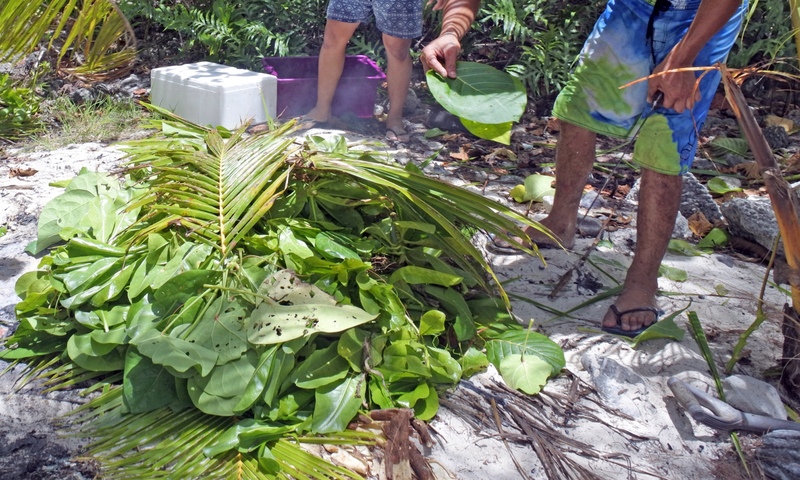 Preparing kalua pig means roasting a whole pig, but you don’t have to go to a luau to enjoy it. Kalua pig is commonly served all over Hawaii as a sandwich or other filling, much like barbecue pulled pork on the mainland. Kono’s Northshore (Oahu) – has been a Hawai‘i Magazine Reader’s Choice award winner for the last two years. They offer their 12-hour slow-roasted pork in breakfast burritos, sandwiches, nachos, tacos, sliders and more. Old Lahaina Luau (Maui) – Kalua pig the traditional way, at Hawaii’s best, most traditional, luau experience. 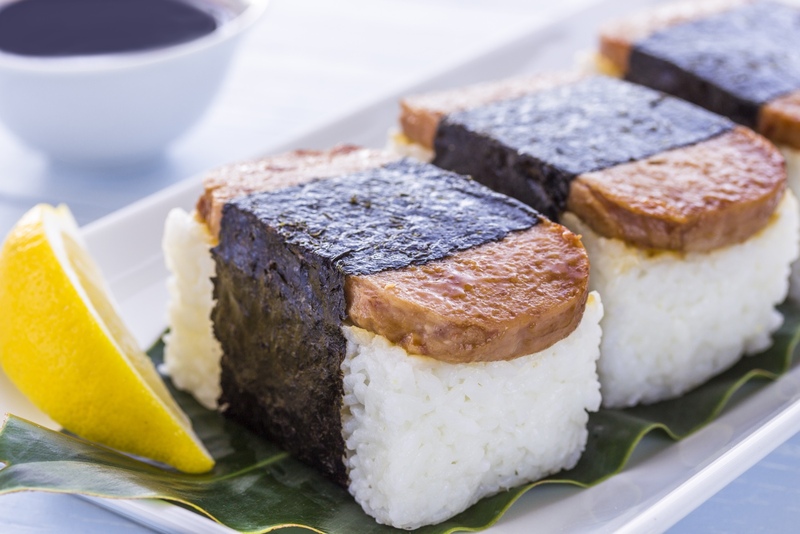 Spam Musubi is another product of the melange that is Hawaiian ethnic culture. The strong Japanese influence contributes the musubi – bite-sized formed rice balls, often wrapped in nori, and filled or topped with a salty or sour ingredient. SPAM is the salty ingredient, courtesy of the introduction of SPAM to Hawaii by GIs in World War II. Hawaii still consumes more SPAM than any other state in the United States. These two influence come together in Hawaii’s signature sushi menu item – Spam Musubi. Mana Musubi (Oahu) – they offer more than 35 varieties of musubi, including SPAM musubi. Order ahead, because they sell out fast. They open at 6:30 a.m. and often close before their scheduled 1:00 p.m. closing time because they’ve run out. Da Kitchen (Maui) – two locations with a wide variety of options, including fried musubi.